Wendy brings to her consulting practice the expertise she developed through her 20-year legal career. Wendy Kahn spent 20 years as an attorney at a major Chicago law firm, where she concentrated in appellate litigation, an area that focuses on complex research, legal writing, and delivering oral arguments before courts. After a successful career, Wendy decided to leave the law to mentor college-bound students. She began volunteering in the college counseling office at her son's start-up high school, then made the transition to college admissions professional by enrolling in UCLA's College Counseling Program. Wendy holds UCLA's Graduate Certificate in College Counseling with distinction. Wendy now brings to her consulting practice the expertise she developed through her legal career. She draws on her strong research skills to guide students as they explore colleges and programs that will provide the right fit. Her extensive background as a persuasive legal writer helps students brainstorm, develop, and polish essays and activity resumes. And her experience as a legal advocate helps students prepare for successful college interviews. 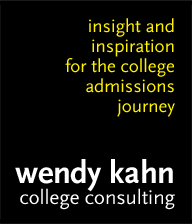 Having guided her own son and daughter through the college admissions process, Wendy understands that students need plenty of support and encouragement as they embark on one of the most important journeys of their young adult lives. Maintains professional membership in the Independent Educational Consultants Association (IECA), the Higher Education Consultants Association (HECA), and the Illinois Association for College Admission Counseling (IACAC). These professional organizations set individual membership requirements based on experience, education, training, and a commitment to continuing education.